Introspection represents the mystical power of the sage who has journeyed into his internal realms to attain wisdom. In solitude, he has traveled through his mind’s eye to achieve the highest level of consciousness. Introspection is willing to share his truth and his knowledge, yet he knows that others have their own path to follow and their own reality. 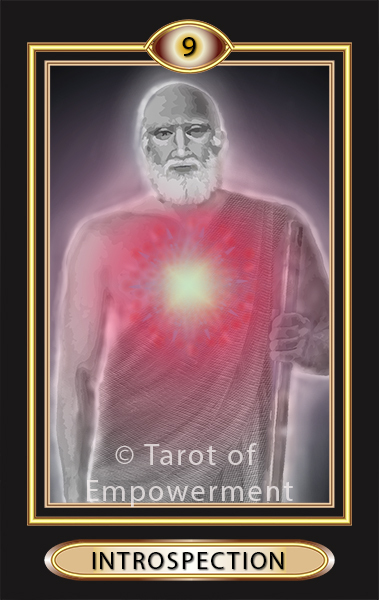 In Tarot of Empowerment, the light radiating from the heart of Introspection represents the integration of his spiritual and internal certainty. Even in a crowd the Hermit stands alone. His staff is a symbol of his long journey and the initiation into the realm of wisdom he has completed. Upright: When Introspection comes up in a reading, it is a reminder to carve a time and place of solitude. Go within to search your soul to align with your unique life path. It is time for you to be alone time to hear the voice within. Take this opportunity to leave behind the pressures and distractions common in our lives. Listen to the voice of your highest consciousness, and act upon the knowledge you obtain from your meditation and search. Be willing to share your truth, as you experience it, while accepting, with compassion, that the path of others may be different. It is sometimes lonely because there are times when one must follow the truth even though others reject it. Empowerment: Introspection empowers you to be strong and compassionate even when it is necessary to stand alone. Reversed: When Introspection comes up reversed, it suggests that you have been isolated long enough and now it’s time to interact more with others. As a block, Introspection suggests you may not be true to your authentic self. Look for the light, and reconnect with the wisdom of your soul. Numerology: Introspection is the number 9, which is about selflessness and integration. The other card that reduces to 9 is the Star card (18).